Doctor Who: The Moffat Scripts – THE DAY OF THE DOCTOR | Warped Factor - Words in the Key of Geek. Dr. Moo revisits the Fiftieth Anniversary Special. Unless you’ve been living inside a confession dial for the last three years, you’ll know that this is the big one: The fiftieth anniversary special of Doctor Who. This is the one when everything changes. 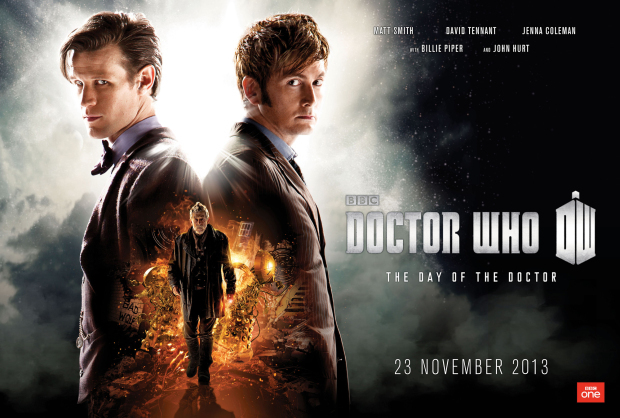 This is the one when Gallifrey is saved! The story is a simple enough affair: the 11th Doctor and Clara are recruited by UNIT to investigate broken paintings, in doing so the Doctor is forced to team up with his previous incarnation when he learns that the paintings are part of a Zygon plot to invade the future, the two of them then work together to force diplomatic peace talks between humans and Zygons to decide upon an arrangement for the two species to coexist. 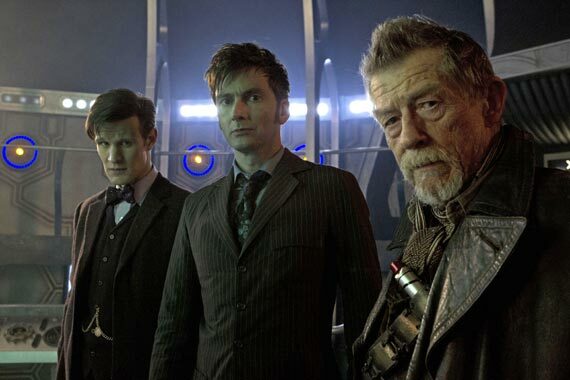 Along the way they’re united with the War Doctor on the final day of the Time War before he destroys Gallifrey. He sees what great men his successors will become and knows that he needs to end the Time War to help them become what they are. However the other two stop him and find a way to save Gallifrey instead. Nothing too complicated there, I think you’ll agree, and in my opinion that’s a good thing. This is one for the non-fans as much as it is for those who would tune in anyway. The two storylines are not overly complicated, like some of Moffat’s other plots (River Song anyone?) but the way he seamlessly ties them both together is a masterstroke. But there’s much more to The Day of the Doctor than that! 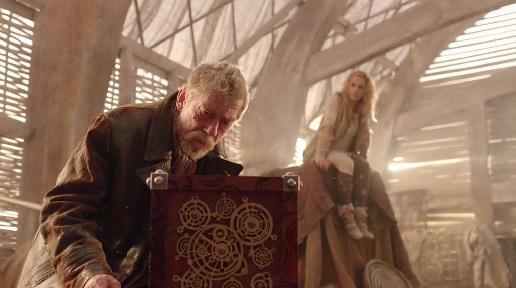 For starters there’s the War Doctor himself, first seen in a twist reveal at the end of series seven and then his origins explained in minisode The Night of the Doctor (which you can see on YouTube for free), this is the first (and sadly only) time we see him in action. We all knew he’d be good because he’s played by John “legendary-doesn’t-do-him-justice” Hurt but we had no idea just how good he’d be. He’s tremendous here. It’s the little way he moves his eyes or turns his head or puts emphasis on certain words that elevate his performance. He’s been in the business since 1962 – that’s one year more than this show has existed – and that experience hasn’t been wasted on him. Hurt portrays his Doctor as a war-torn fallen hero and does this convincingly, but he also manages to play his Doctor as younger than the two young men he costars with. Cards on the table: this is the best performance anyone had ever given as the Doctor up to this point. Just over a year later he was up for a knighthood, make of that what you will. In fact, everyone in this is good. 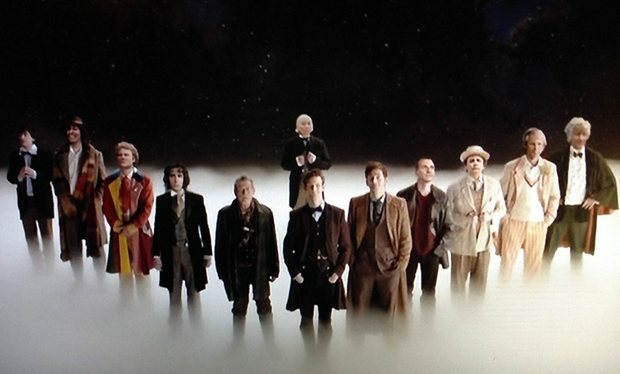 Matt Smith is brilliant and convinces as the oldest Doctor in the youngest body. David Tennant slips back into the role of the 10th Doctor with such confidence it’s as if he never left and gives one of the best performances he ever gave as the character. Both of them are having so much fun as the two Doctors that it’s easy to forget they’re acting, and when they have fun so do we. The playful teasing about their sonic screwdrivers (“Compensating?”) is reminiscent of the interactions between Jon Pertwee and Patrick Troughton in The Three Doctors and that can only be a good thing! Also the two companions Rose and Clara. Rose is utilised sparingly but Billie Piper is outstanding with her limited screentime, somehow keeping up with Hurt and proving once and for all that she’s a phenomenally good actress and one of the best to play the Doctor’s companion (even if I don’t like Rose I can still appreciate Piper’s acting). 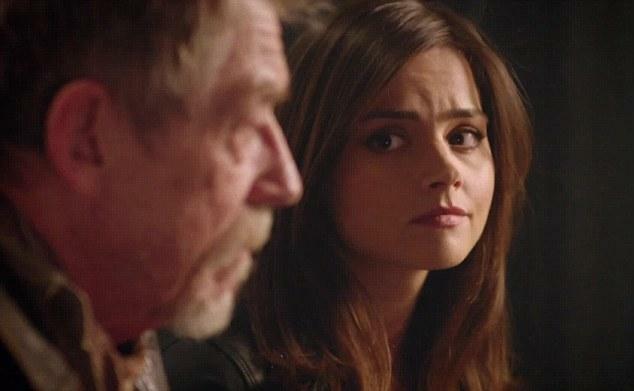 Clara, by contrast, is thrust right into the centre of the story. She’s the one who gets the War Doctor to open up, and she’s the one who makes the Doctors stop using The Moment to destroy their home. I said that Piper was one of the best actresses to play a companion because Jenna Coleman is better; in fact Coleman is THE best actress ever to fill that position. Throughout series seven she proved it repeatedly but this is when she really starts to shine and prove she’s more than just eye candy (not that she isn’t good for that too… Who said that?). And then there’s the fan service. There’s the 10th Doctor in the 11th’s fez, there’s the wedding of the Doctor and Queen Elizabeth I, there’s the War Doctor mocking the gung-ho attitude of the revived series towards the sonic screwdriver, there’s tonnes of visual treats in the Black Archive, and there’s the finale when all the Doctors (including Peter Capaldi!) come together to save Galllifrey. But one moment stands out more than any other. The moment when the 11th Doctor sits down and talks about becoming curator of the gallery only to be told “You know, I really think you might!” gives you tingles down your spine. I recognise that big booming voice anywhere – The Fourth Doctor! It can’t be him can it? You’re right, it’s not him, but it sure is close. Say hello to Tom Baker (Sir Tom Baker, your majesty?) as the Curator. Is the Curator a future incarnation of the Doctor? Moffat leaves it ambiguous but strongly hints that he is. 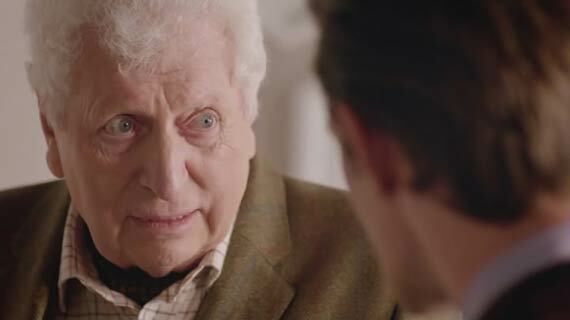 The Doctor‘s final incarnation looks like Tom Baker… there’s something very right about that. And of course he plays the part magnificently but this is Tom Baker in Doctor Who so I think it would literally take divine intervention for him to do otherwise. The thing about The Day of the Doctor is that it’s filled with moments to please fans and as a result it all too often strays into spectacle over story. But if there’s ever been an episode of Doctor Who that is allowed to get away with doing that then this is that episode. It’s designed to celebrate a show on its fiftieth birthday, one that when it started nobody expected to last more than fifty minutes. Allow me to conclude by summing up The Day of the Doctor in ten words: Doctor Who has lasted fifty years, here’s to fifty more!